2.From the File menu select New Project. 3.From the Project menu select Add Target. Choose the first target. 4.From the Project menu select Add Model. Select the model that corresponds to the first target. 5.Repeat step 3 and 4 for the remaining targets. 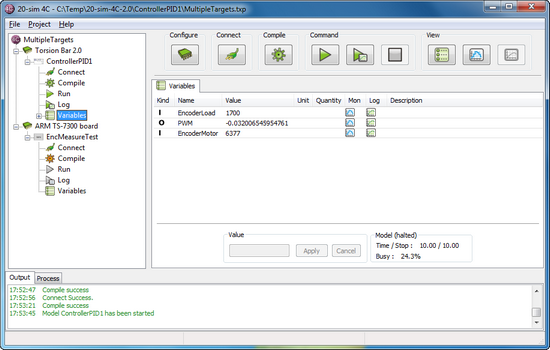 Now you are ready to manage all the targets and control their operation from a single instance of 20-sim 4C. A 20-sim 4C project containing 2 targets with different models.